This is the third entry in my series of buffer overflow tutorials. In case you missed them, here are entries one and two. These tutorials are designed to build upon skills taught in each of the preceding tutorials, so I recommend that you complete the first two before you attempt this one. In this entry we will be doing another SEH Stack based overflow, however in this case our buffer will be translated into a hexadecimal value in memory at the point where the SEH overflow occurs. This requires us to structure our buffer slightly differently, and also requires us to use a different method to find our SEH overwrite offset. The vulnerable application we will be using is Serv-U 9.0.0.5, which has an exploitable vulnerability related to its handling of overly long Session cookie values. I will also expect at this stage that you know how a SEH Based Buffer Overflow exploit is achieved. This is covered in my second tutorial. Your attacker and victim systems will need the following software installed in order to follow this tutorial. By using BackTrack 4 Final for your attacking system you will take care of all the attacking system prerequisitites. For this particular exploit, we need to send a rather large buffer to the vulnerable application, so ensure that the network between the two systems is reliable. If you are having issues reproducing the exploitable crash, the networking layer could be causing the problem. Confirm that you are not getting RST packets from the victim system while sending the malicious HTTP request if you can't make the application crash. If this is the case then you will need to troubleshoot the problem at the network layer. I have covered the process of attaching a vulnerable application to a debugger extensively in my last two tutorials, so I will just provide a very brief overview of the process here. The process that you want to attach to in OIllyDbg is named Serv-U.exe, and by default it will be installed as a Windows service named "Serv-U File Server". Stop and start the process by using the Services Control Panel option, and use OllyDbg to attach to the process once it is running. As before, you will need to restart the vulnerable process and reattach to it in the debugger each time you want to reproduce the exploitable crash. After checking the POC in the original advisory, looking at other examples of the exploit, and one other advisory, I discovered that the exploitable crash can be reproduced by sending an overly long Session cookie to the Serv-U application in a HTTP Post request. After some trial and error involving sending different buffer sizes to the Serv-U application, and viewing the structure of the stack in the debugger, I eventually settled on a Session cookie size of 96000 bytes as being optimal for exploitation. I won't reproduce the entire process I used here, because it makes for pretty boring reading, but it basically involved modifying the size of the buffer sent, and confirming that the SEH Handler on the stack was overwritten and that there was space inside our sent buffer after the SEH Handler. The second criteria is not absolutely necessary, but it makes exploitation slightly easier. postreq+= "Host: " + target_address + "\r\n"
postreq+= "Cookie: Session=" + buffer + "\r\n\r\n"
When we trigger this crash we will get an access violation, and if we check the SEH Chain (View->SEH Chain menu option) we see that it has been overwritten with 'AAAAAAAA'. This is unusual, because we sent the application a buffer full of 0x41 bytes, and if the SEH Handler had been overwritten from our buffer we would normally expect to see a value of 41414141, or four lots of 41. Instead, each byte that makes up the the SEH Handler overwrite has the value 'AA'. It looks as though the ASCII representation of the bytes we have sent (which is 'A' for 0x41), have been converted to a hexadecimal nibble (half a byte) so that the value of two of the bytes we have sent are now represented in a single byte in memory. Lets further test this theory by sending some different values in our buffer and checking to see how they are represented in memory when the application crashes. Lets try sending 'abcd' (lower case) to the application. At the time of this crash, the SEH Handler points to CDABCDAB. This time the SEH Handler points to Crash points to 000F000F. The lowercase 'f' was converted to a Hexadecimal F, and the 'ghi' characters, which don't have a Hexadecimal equivalent, were converted to 0. Lets try one more - 'efgh'. This time the SEH Handler points to 00EF00EF. So ASCII characters A-F, regardless of case, are translated to hexadecimal values A-F, and any other character converts to a 0. Lets do a check with numbers '0123' to confirm our Hexadecimal theory. This time, the SEH Handler value is 23012301. So our ASCII string of characters that we send to the application in the Session cookie is interpreted as a Hexadecimal value in the memory buffer that overwrites the SEH Handler. In the previous two tutorials, we found offset values within our buffer via using the Metasploit pattern_create.rb script. This method is not going to work in this case however, because the Metasploit script uses characters outside of the 0-9, A-F range, and it uses both uppercase and lowercase characters. Any of these out of range characters will be translated to a 0, or the case information for the A-F characters will be lost, and this will prevent us from being able to provide the correct input value to pattern_offset.rb to find the offset. We will have to use a different method to find the overwrite location. Knowing that characters 0-9 and A-F will be represented in the memory display we see in the debugger, we can use a set of structured buffer made up of these characters only to narrow down the exact overwrite location. When we run this exploit, the value of the SEH Handler is set to DDDDDDDD. 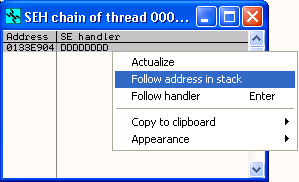 If you want to, you can confirm that the buffer is structured as expected by right clicking on the SEH Handler Value in the SEH Chain window and selecting Follow address in stack. On the stack you should be able to see that the SEH Handler sits within a large buffer of D values (with the exception of some minor mangling just before the SEH Handler). This means that our overwrite occurs in the 'D' section of our buffer. This gives us a range of 78000 and 84000 where our overwrite location sits, given that 0xD x 6000 is 78000 and 0xE x 6000 is 8400. Now lets narrow this down further. 6000 divided by 16 is 375. Lets create a buffer of mostly 'A' characters, but lets put a block of 6000 characters made up of an even distribution of values 0-9 and A-F (375 of each) between bytes 78000 and 84000. The next value of the SEH Handler is AAAAAAAA. This means that the overwrite occurs between bytes 3750 (0xA x 375) and 4125 (0xB x 375) within our 6000 byte buffer, or between bytes 81750 (3750 + 78000) and 82125 (4125 + 78000) within the total buffer. If we check the overwrite location on the stack we can see the 'B' values starting a little bit below the block of 'A' values that have overwritten our SEH Handler, so we know that we are within our 6000 mixed block. Lets narrow it down once more. 375 doesn't divide evenly by 16, so we will use a block of 24 sets of 0-9 and A-F characters, making for a total block of 384. As long as we completely cover the 375 character space that we know our overwrite location sits within, it doesnt matter if we go a bit over. We insert this set of mixed characters into the 375 byte window where we know our overwrite location sits - sometime after byte 81750. 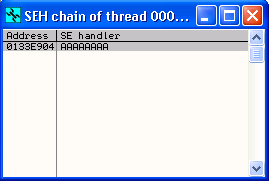 This again gives us a SEH Handler value of AAAAAAAA and when we check the stack we can see that the SEH Overwrite occurs after the tenth A character, and the pointer to the next SEH record (the 4 bytes immediately before the SEH overwrite) also has the value AAAAAAAA, and occurs after the second A character. From this we can actually work out the exact overwrite address. For the pointer to the next SEH record it is 2 + 240 (0xA x 24) + 81750 = 81992. Lets restructure our skeleton exploit and see if the SEH Handler is overwritten by the expected value of CCCCCCCC. Success! We get a value of CCCCCCCC in the SEH Handler. Now that we know the exact offset of the SEH Handler overwrite within our buffer, we need to find an appropriate address that can allow us to gain control of code execution via the Windows error handling routines. As discussed in my previous tutorial on SEH Buffer Overflow exploitation, we need to find a module loaded by the application that hasnt been compiled with the /SafeSEH ON option AND which hasn't disabled all addresses in that module being used as SEH Handlers by using the IMAGE_DLLCHARACTERISTICS_NO_SEH flag. As it did in the last tutorial, the OllySSEH Ollydbg Plugin crashed for me again, so Im doing things the slightly harder way once more. I checked the list of loaded modules in OllyDbg (View->Executable Modules menu option) and looked first for a third party module loaded with the application. As mentioned in my previous tutorials, a third party module (in other words one provided with the application itself) has the benefits of usually being compiled without the /SafeSEH ON and IMAGE_DLLCHARACTERISTICS_NO_SEH options, making it suitable for use with SEH overwrite exploits. It also provides a stable overwrite location that should work across multiple Operating Systems, since dlls provided with the application should be identical and should be loaded from the same base address on different systems. Looking at the list I picked the first module provided with the Serv-U application that did not have a leading zero byte in the base address - libeay32.dll. I picked a module without a leading zero byte because zero bytes usually break buffer overflows, however it turns out in this case this doesn't actually matter because the character conversion that occurs creates each byte that appears in memory from two ASCII characters sent from our exploit. This means that we can actually create a zero byte in memory if we wish by using two ASCII zeros (\x30), effectively giving us no bad characters in this exploit! Lets transfer this file to our attacking system and analyse it with msfpescan to confirm that it doesn't have the compiler options set that would make it unsuitable for use in providing a SEH Overwrite address. Remember that If we see any SEHandler entries, it means that a SEH Handler exists in the dll and that the module was compiled with /SafeSEH ON. We see no such entries here, so we are safe on this count. In the DllCharacteristics value, we want to confirm that the third byte from the left does not have the '4' bit set to confirm that the module does not have the IMAGE_DLLCHARACTERISTICS_NO_SEH flag set. If the value of the third byte (the one marked by 'X' in 0x00000X00) is not '4, 5, 6, 7, C, E or F' (in other words if the '4' bit or 00000100 is not on), then the module does not have this flag set. The third byte does not have the 4 bit set, so we are safe on this count as well. Now lets proceed with finding an appropriate overwrite address in libeay32.dll. As discussed in my SEH Buffer Overflow tutorial, to take control of code execution, we can enter into our buffer by using a RETN instruction on the third value on the stack at the time that the initial exception is handled using the Structured Exception Handler. 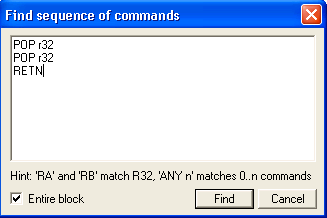 To do this we look for a POP, POP, RETN instruction in libeay32.dll. View the code of libeay32.dll in OllyDbg (right click on it in the Executable Modules window and hit Enter or right click and select View code in CPU), and right click in the CPU pane and select Search for->Sequence of commands. I found my a POP, POP, RETN instruction at 0FB010C1 in libeay32.dll which I will use to overwrite the SEH Handler to gain control of the CPU. Now if you remember from my first SEH Overflow tutorial, running the POP, POP, RETN instructions takes us into our buffer four bytes before the SEH Handler address. What we want to do to give us some usable buffer space to work in is to jump over the overwritten SEH Handler to the uninterrupted buffer space beyond. A JUMP SHORT 6 instruction will achieve this for us, but remember that we cant just enter the \xeb\x06 into our buffer directly because of the character translation to Hexadecimal. What we need to do is instead enter the ASCII equivalent of "EB06" and let the Hexadecimal translation convert this for us to the byte equivalent. 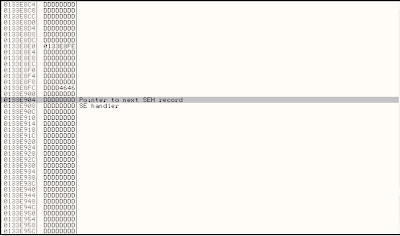 If you set a breakpoint on the SEH Handler address and run this exploit, after you pass the exception through to the application to handle using the Shift + F9 keys, you should now be able to step execution through to the area of the buffer after the SEH Handler using the F7 key. 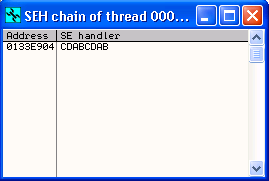 Remember that to set a breakpoint you can either select the address in the CPU pane and hit F2 or just hit F2 on the entry on the SEH Chain window once the crash has been triggered. Now we have control of the CPUs execution path, we need to add some shellcode to our exploit so it will do something useful. Again, we won't be able to directly add the bytes of the shellcode directly to our exploit, we will need to convert them to ASCII characters first. This command below will generate some reverse shell shellcode, and convert it to a workable format that can be easily pasted into our exploit. An explanation of what this command is doing may be helpful. We run msfpayload using the R option to provide the output in raw bytes, and we then pipe this into 'xxd -ps' to convert the binary output from msfpayload into the Hexadecimal representation of the values of each individual byte. 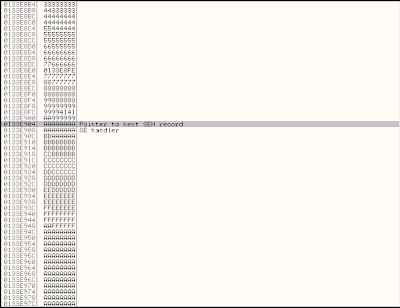 This is similar to what you would see in a Hex Editor and also similar to the C output format of msfpayload without the \x characters before each byte. When then pipe this into 'tr 'a-f' 'A-F''. This is not strictly necessary since the case of the A-F characters doesn't matter for the purpose of the Hexadecimal translation, Im just doing it to make what we enter visually match what appears in the debugger. Then we pipe that into 'sed 's/0A$//'' which removes the trailing line feed character added by msfpayload. We then pipe into 'sed 's/$/"/'' and 'sed 's/^/"/'' which adds double quotes to the end and start of each line for easier pasting into our exploit. Lets see what the final exploit code looks like. We have shell! This completes this exploit. Do you involve inn the Ethernet Driver level events synchronizing with TCP sockets? Could you elaborate the solution regarding the networking layer problem. I'm not able to trigger the vulnerability, and wireshark does find an RST packet. threshold on my router and sending a smaller buffer, but still no result. Try and narrow down the location of the problem. what if you send the buffer from a machine on the same subnet, or if you send it from the machine itself using the loopback address? First of all thanks for responding. I tried sending the buffer from a machine on the same subnet. At first it didn't work, but after sending the buffer about 25-30 times the program crashed. So far I have not been able to crash the program again. Then, about sending the buffer to the loopback address. I got a bit confused about the setup. and port:80 , but the debugger didn't report an error! Trying to find out where I screwed up I installed Wireshark on my target machine and found out the Wireshark isn't able to capture on the lo interface in windows. This is were I got stuck. 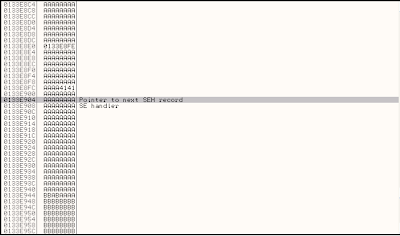 Try sending from the machine itself and use the externally available interface instead of the loopback. This will eliminate errors caused by other elements of the network and should let you capture the traffic using Wireshark. I was just curious, what could be the cause for character translation ? The translation is probably done to make storage of the value more efficient, e.g. the ASCII characters "AA" which would normally take up two bytes in memory can be stored in one byte after this translation. Thanks lupin for the great write-up. Just to share that this long session cookie exploit works with a GET request too. I am currently testing a http fuzzing tool and would like to found the minimum amount of bytes of 'A's to crash a server. So I wrote a python script, it does crash the server but it doesn't overwrite the EIP of the debugger with 'A's. So I would like to seek assistance for my issue. I would like to know is it whether my python script the way I wrote having issue or other issue. Depends on what server you're fuzzing. It looks like you're trying to overflow the URI component of a HEAD request with up to 256 A characters. Is the server you are fuzzing vulnerable to an EIP overwriting vulnerability in that parameter? Are you sure you don't need to add the HTTP version or any other headers to your request? thanks to all sharing a great information.this article is awesome.